A woman has called her husband "mad" after he spent over £650 on a shop in preparation for a no-deal Brexit. Juliet East, from Worcestershire, shared a picture on Twitter of the haul, which includes 144 rolls of toilet paper and over 50 tins of food. 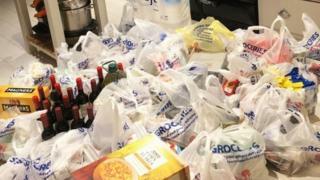 After looking at lists suggesting items to stockpile, her husband "drunkenly" put in an order with Tesco that totalled £658.29. The "gently mocking" tweet received hundreds of comments and likes. Ms East, who works in the hospitality industry, said she did not tell him how much to buy for the family of five and "couldn't believe" the amount her 58-year-old husband, Tony Smollett, an IT director, ordered. "I didn't think he was going to buy so much," she said. Image caption Ms East said her husband "doesn't want anyone online to think he's mad"
"He just went mad and bought lots of everything." Ms East, said she decided to stockpile certain items when they began planning for a no-deal scenario at her work. She said: "It's becoming increasingly apparent that no-one knows what is going on. "Many of our favourite foods come in from overseas and we don't want to run out of things. "It's the same way people fill their cars with petrol when there's a shortage." She added the reaction on Twitter was not always positive, with other users giving her a "hard time" about the cost of the food and suggesting she was causing a sense of panic. "I'm the last person to try to create a panic. We're just keeping all of the bases covered."